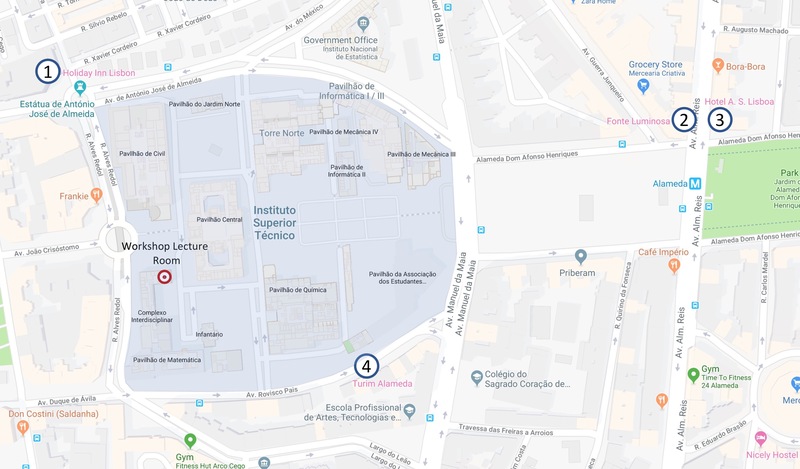 We include below a short list of hotels located around Instituto Superior Tecnico - IST (click on the image below to zoom). For more options of hotels within walking distance of IST click HERE. Participants should make their own reservation directly with the Hotel. In some cases we pre-booked a few rooms with "special" fares. We strongly advise you to check in advance whether there are better offers for these hotels in their webpages. If you wish to book a room at Holiday Inn with these fares, fill the reservation form available here and send it to the hotel according to the instructions. You will have access to a "special" fare by using the promotional code HIGGSFL2019 upon online reservation. However, notice that this hotel has many offers that can turn out to be more advantageous.